Recent proposals to reopen an abattoir in Skegness have attracted local opposition, with a facebook group and online petition set up. The Heath Road abattoir closed down in January after it ran into financial difficulties , and the proposed re-opening has generated opposition because slaughter methods used there would be halal. 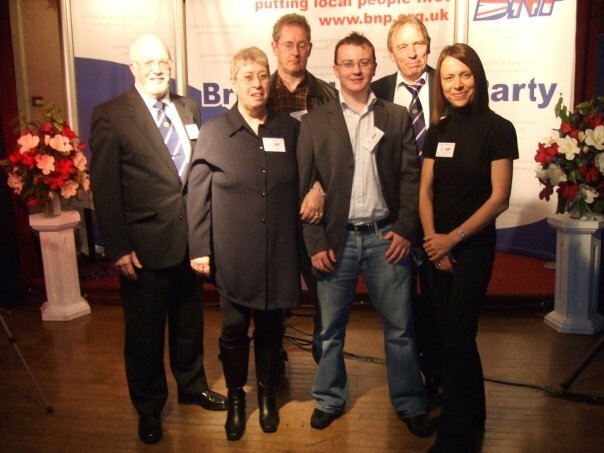 Although the initial opposition was not overly linked to the far-right, fascists have been quick to take an interest in the issue, with the BNP’s Lincolnshire Coastal branch adopting it as their main campaigning theme. Other groups have been sniffing around the issue as well, and it’s certain that none would have criticised the abattoir reopening if it were to be staffed by “indigenous” knifemen. Ritual slaughter for halal is becoming an important focus for the far-right, with the BNP in particular targeting it; they recently held a (piss-poorly attended) national picket of a branch of Subway in Sunderland which sells halal meat. They aim to portray their opposition to halal on the grounds of animal welfare, but unsurprisingly this rings rather hollow on investigation; there is no opposition from the fascists to factory farming in general, nor is there any indication of what they consider acceptable practice in a slaughterhouse might look like – the latest fundraising dinner of the Lincolnshire Coastal BNP featured Lincolnshire sausage, presumably obtained from consenting pigs who died quietly in their sleep, or something….. The halal meat issue is (of course!) more complex than it is painted by the BNP. It is often argued by muslims that slaughter without pre-stunning (which is the central issue giving grounds to accusations of cruelty) is actually less distressful for the poor animal than the conventional methods of stunning – although almost every animal welfare organisation disagrees, and what scientific evidence there is suggests that stunning is less traumatic. For what it’s worth, this writer would guess that pre-stunning is indeed “less cruel”, but hopefully I’ll never know for sure. However, it is important to note that, contrary to general impression, halal rules do permit the pre-stunning of animals, as long as the stunning itself does not kill the animal. It is also important to note that there are several interpretations of halal rules in practice – for example, there are differences about which methods of stunning are acceptable. The RSPCA cites an estimate, from the Meat Hygiene Service, that around 90% of UK halal-slaughtered animals are in fact pre-stunned – in other words, from a welfare standpoint, they are treated much the same as the majority of animals killed in non-ritual abattoirs. (The majority killed for kosher consumption are also pre-stunned, incidentally). The BNP are yet again displaying their opportunism in portraying halal as “truly barbaric” and “un-British”, whilst showing no analysis of its complexities, nor any campaign on factory farming in general. Their failure to mention kosher slaughter, which is very similar to halal in most practical aspects, also shows their expediency – it’s not considered strategic to be overtly anti-semitic at the moment. A more progressive strategy for ensuring animal welfare in halal and kosher is not hard to imagine, perhaps involving campaigning for universal application of stunning to all ritual slaughter, for example. Of course many would argue that a slaughterhouse can never be “humane”….and non-halal abattoirs are certainly not exempt from shocking breaches of welfare standards. The key point here is that any worthwhile campaign on animal welfare must be careful to deprive the far-right of another opportunity to demonise British muslims. The BNP and other fascist hangers-on will be unable to make political capital out of the Skegness abattoir controversy if they are opposed, and we hope that – yet again – they will be shown for the two-faced opportunists that they are. Two men who subjected an Asian family to racist abuse were jailed for 10 months on Friday. Kelvin Barratt of Courtleet Way, Bulwell, threatened the owners of a store with a knife and said “I’m EDL” and asked them “What religion are you?” Stefan Davis of Bromley Close threatened to smash and rob the shop. Both men admitted racially aggravated harassment and using threatening words or behaviour. Barratt additionally pleaded guilty to having the knife. Davis said that alcohol was a factor in his behaviour. Because the region’s far right isn’t doing anything interesting right now, I thought it would be useful to highlight this recent post by Exposing the English Defence League. It features the words of former EDL member, Steve Littlejohn, about his disillusionment with the organisation and reveals some insights into the cynical strategies they’ve employed. He claims the leadership aimed this hateful ideology at “football hooligans and really aggressive people” because they knew they “were goin to face violent opposition” but “as it got publicity they didn’t want us kind and tried to get over this peaceful protest shite”. We hope that Steve and many other followers get out of the fucked up little cult that is the English Defence League and can rehabilitate themselves. 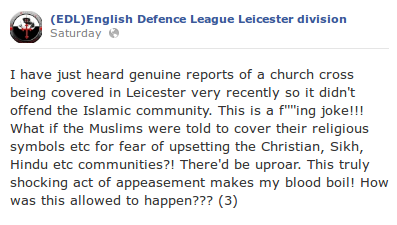 Leicester EDL are helping to whip up a frenzy of ill-informed prejudiced hysteria in the run up to their next piss up in Walthamstow. They’ve reposted a poster for a Muslim swimming session as proof that there is a two-tier creeping-sharia reverse-racist politically-correct system oppressing them and their beloved England because, *ghasp* it is “FOR MUSLIMS” and that there are “separate sessions for brothers and sisters”. The response of their fans has been the usual display of infantile pratfalls. Michael Baverstock starts us off with “the only time id piss in the pool and not feel guilty” before mumbling some barmy conspiracy theory about a cull of 2.5bn people. Keith Finch reckons he would “leave bacon and pork sausage in the changing rooms the night before”. What a naughty little boy! But Ed Coates wants to go further saying he would “put a dead pig on a lilo and float it in the middle of the pool”. Dean Smith recommended “fill[ing] the pools with acid” and Adrian Read hoped that this would be “Joined by pirahna s”. Their mums have all been informed and they’re not allowed to play out for the next week. Slightly less immature, but considerably more loony, are the comparisons of the move with apartheid. For those in the EDL who seem a bit hazy about South African history, apartheid was enforced by the white colonists who had military and political control of the country and used a theory of white racial superiority to segregate society. Holding a weekly swimming session to accommodate the desires of a religious minority doesn’t quite compare. 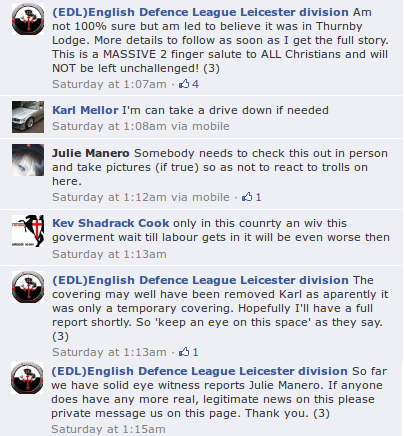 The EDL are paddling in the shallow end as ever.